See celebrity chef demos at the IKEA® Cooking Stage. 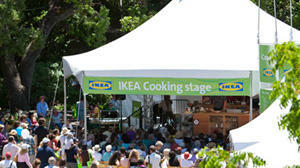 This year’s main entertaining and cooking stage features a fully equipped kitchen from IKEA®. You’ll be able to check out the state-of-the-art kitchen and watch celebrity chefs demonstrate signature recipes and techniques. Weekend attendees are invited to come on stage and tour the fully equipped IKEA® kitchen. Learn more about IKEA® products, including the AKURM/ADEL cabinets and fixtures.